It dedicated a new building on April 8, 1876, as reported in the Chicago Tribune of that date. Its previous building, at Van Buren and Third (now Plymouth Ct.) was destroyed in the fire of 1871. The website ChicagoPC.info includes a vintage postcard of this building. In 1912, it moved to a new location at 44th and Grand Boulevard (now King Drive). The American Jewish Archives in Cincinnati, Ohio holds records of this congregation and has placed a finding aid online. 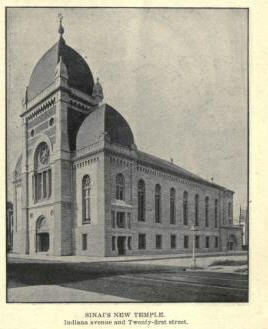 The congregation's current website offers a history of the synagogue. Public domain thumbnail image from The Jews of Illinois (Chicago : Bloch & Newman, 1901), page 329. Available through the Internet Archive.